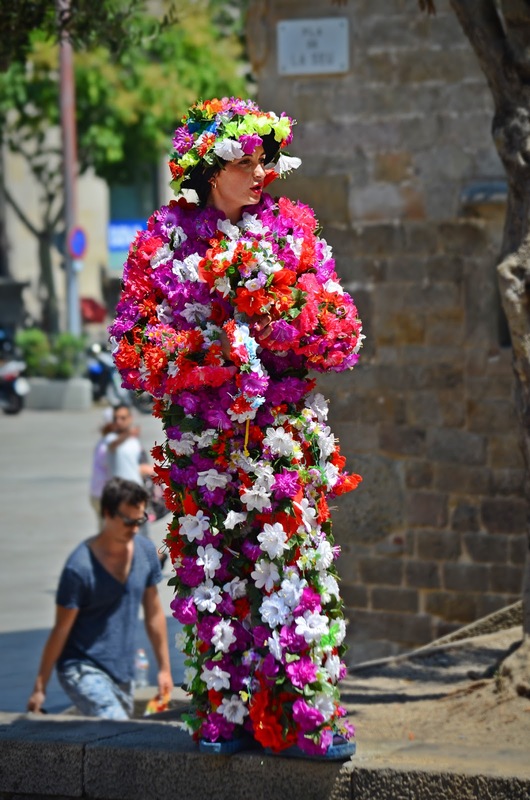 With this woman literally covered with flowers near Barcelona Cathedral I start my holidays 2017. Let the coming month of August be happy and amusing to many, to those fortunate enough to have some rest from the monotony of a day job. To those who don't, let these days be joyous too. This summer is being terribly hot in Barcelona so I hope this lady gets compensated somehow for her tremendous effort under the sun. PS: I am trying to revamp the blog. It is taking more time than I thought. A great amount of pictures were hosted in Photobucket.com, a company whose malpractice has ruined the work of many bloggers who trusted them, including myself. I will never choose Photobucket again, you have my word on that! What colourful garb this woman is wearing. I have seen many different kinds of wardrobe, but this one is unique. Your photo is a happy one. Wow, that's unique dress. It made her out-standing. What a nice post!